ESO’s La Silla Observatory in Chile released a striking image of star cluster NGC 3293 with clouds of glowing red gas and streaks of dust in the background. 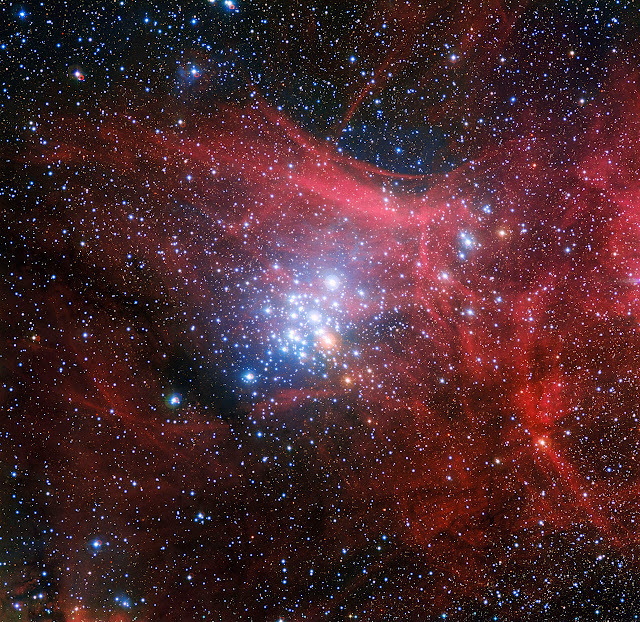 NGC is composed of young stars are believed to be less than ten million years old and is about 8000 light-years from Earth in the constellation of Carina (The Keel). Using the Wide Field Imager (WFI) installed on the MPG/ESO 2.2-meter telescope at the observatory, astronomers study young star clusters such as NGC 3293 to learn more about the evolution of stars. Star cluster are groups of stars that are held together by their own gravitational fields. Open star clusters and globular are the two types of clusters. NGC 3293 is an open star cluster; loosely clustered groups of young stars. The gravitational attraction between the stars in an open star cluster may be weak or non existent. Globular star clusters are made up of hundreds of thousands of very old stars that are gravitationally bound. These stars are attracted to each other and form a very tight sphere. The stars within a globular star cluster orbit a galactic core and the amount of stars within get denser going toward the center. This image was taken with the Wide Field Imager (WFI) installed on the MPG/ESO 2.2-metre telescope at ESO’s La Silla Observatory in northern Chile.